Keenum completed 23 of 34 passes for 262 yards, two touchdowns and an interception during Sunday's 30-23 loss in Kansas City. He added nine yards on the ground and lost a fumble. Keenum completed 14 of 21 passes for 161 yards with a touchdown and an interception in the Broncos' 45-10 win over the Cardinals on Thursday. He also rushed four times for four yards. Broncos coach Vance Joseph said Sunday after the team's 23-20 loss to the Rams that Keenum will remain Denver's starter Week 7 against the Cardinals, Nicki Jhabvala of The Athletic reports. "Case is our quarterback," Joseph said. Keenum completed 25 of 41 pass attempts for 322 yards, two touchdowns and an interception in Sunday's 23-20 loss to the Rams. He also carried the ball once for six yards. Analysis: Keenum had managed only a field-goal drive until 1:34 remained in the third quarter when he hit Emmanuel Sanders from 22 yards out. Having only thrown for 137 yards at the half, the 30-year-old quarterback missed a play while getting checked for a concussion. When he returned, he again relied on a big deficit to rack up stats and almost made a game out of the affair. He'll try to go a third straight contest with at least 320 passing yards and two touchdowns Week 7 at Arizona. Keenum completed 35 of 51 passes for 377 yards, two touchdowns and an interception during Sunday's 34-16 loss at the Jets. Keenum completed 21 of 33 passes for 245 yards and an interception in Monday night's 27-23 loss to the Chiefs. Analysis: Keenum managed the game fairly well, but frustratingly finished with zero touchdown passes and one interception for the third straight week. 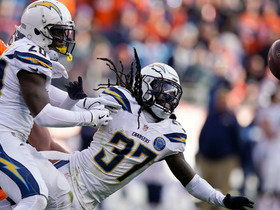 Even more agonizing for him, he narrowly missed a wide-open Demaryius Thomas for what would've been the game-winning touchdown with under 30 seconds remaining. Stuck in a bit of a rut, Keenum will now be tasked with breaking his touchdown drought at the Jets in Week 5. Keenum donned a knee brace during Thursday's practice, but was listed as a full participant on the team's injury report, Zac Stevens of BSNDenver.com. "Case came out of the [Week 3] game fairly healthy," coach Vance Joseph said of the quarterback. "He had no swelling, he has no issues. He should obviously feel better this week." Keenum went for 22 of 34 for 192 passing yards and an interception during Sunday's 27-14 loss in Baltimore. Keenum (knee) practiced fully Thursday, Zac Stevens of BSNDenver.com reports. 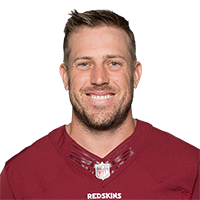 Analysis: Keenum's availability for this weekend's game against the Ravens is in no peril and he'll look to bounce back from a subpar fantasy outing in Week 2, in which he completed 19 of 35 pass attempts for 222 yards and an interception in a 20-19 win over Oakland. He'll be taking aim Sunday at a Baltimore defense that embarrassed the Bills in a 47-3 triumph in Week 1, then turned around surrendered four passing TDs to the Bengals in a 34-23 loss this past Sunday. Keenum (knee) returned to practice Thursday, Nicki Jhabvala of The Athletic reports. Analysis: Knee soreness caused the quarterback to rest Wednesday, but his return to work Thursday supports the notion that Keenum will be fine for Sunday's game against the Ravens. Keenum will be held out of Wednesday's practice to rest a sore knee, Mike Klis of 9 News Denver reports. Analysis: With the soreness considered mild, Keenum is expected to return to practice Thursday and then play in Sunday's road game against the Ravens. His matchup seems to be more of a concern than the minor knee injury, though Baltimore did surrender four touchdown passes to Cincinnati's Andy Dalton last week. Keenum completed 19 of 35 pass attempts for 222 yards and an interception in Sunday's 20-19 win over Oakland. He added 16 yards and a touchdown on three carries. Keenum completed 25 of 39 pass attempts for 329 yards with three touchdowns and three interceptions in Sunday's 27-24 win over Seattle. Analysis: Keenum was shaky with the ball, but obviously fantasy owners like three scoring strikes. 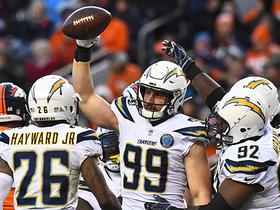 The veteran quarterback primarily focused on his top two wideouts, Demaryius Thomas and Emmanuel Sanders, who combined to catch 16 passes for 198 yards and two touchdowns. He wasn't able to get much going in the preseason, so despite the three turnovers Sunday, it's encouraging that he was able to move the ball well and generate nearly 30 points. 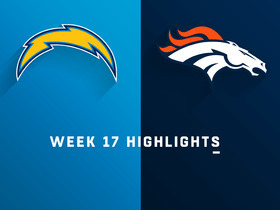 In Week 2, Keenum will face the Raiders at home. Keenum completed 12 of 18 passes for 148 yards in Friday's preseason game against Washington. Keenum completed eight of 13 passes for 78 yards and a two-point conversion during Saturday's 24-23 loss to Chicago. 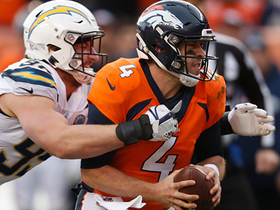 Denver's starters, including Keenum, figure to play between a quarter and a quarter and a half in this Saturday's preseason game against the Bears, Mike Klis of 9News Denver reports. 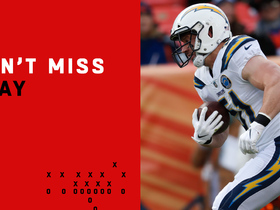 Analysis: The extra time should be telling for Keenum and the rest of Denver's starting offense, which failed to get it going in the preseason opener. The veteran quarterback completed just one short pass during two uneventful drives against Minnesota. Keenum completed one of four passes for five yards during Saturday's 42-28 preseason loss to Minnesota. Keenum's completion percentage could notice a boost within offensive coordinator Bill Musgrave's scheme, which features quick, short throws, Tyler Polumbus of The Athletic reports. 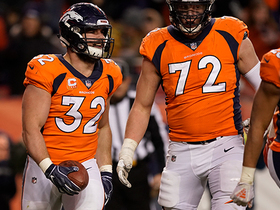 Keenum has received all of the repetitions with the first-team offense during organized team activities, Aric DiLalla of the Broncos' official site reports. Keenum's two-year contract with the Broncos is official, Aaron Wilson of the Houston Chronicle reports. Analysis: Coming off a shocking breakout season, Keenum joins another team with a potent wideout duo and promising defense, though it's still an overall downgrade in supporting cast. This doesn't preclude the Broncos from using an early draft pick on a quarterback, but it's safe to assume Keenum will get the Week 1 start. 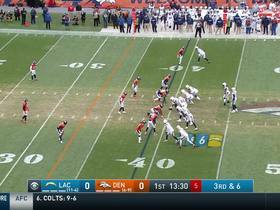 Denver still appears to need a tight end, a No. 3 receiver and a couple more starting-caliber offensive linemen. Keenum intends to sign with Denver when free agency begins Wednesday, ESPN reports. Analysis: It sounds like the Vikings are set to try and sign Kirk Cousins. Keenum will thus move to Denver. However, none of this is official and players could change their minds before signings can officially begin Wednesday. Keenum threw for 3,547 yards and 22 touchdowns in leading the Vikings to the NFC Championship game. 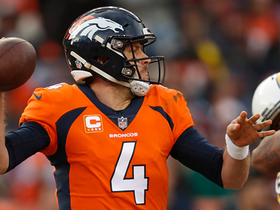 Keenum could draw interest from the Broncos, Browns, Cardinals and Vikings, Mike Klis of 9News Denver reports. Analysis: With the Vikings shaping up as the early favorites for Kirk Cousins, it won't come as any surprise if Keenum is forced to find a new team. 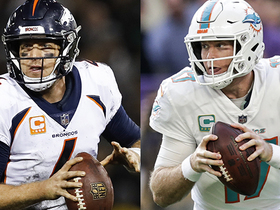 In addition to the franchises mentioned above, the Jets and Bills figure to be in the market for quarterbacks. Keenum will be an unrestricted free agent when the new league year begins March 14. The Vikings don't intend to use their franchise tag on Keenum before the March 6, allowing the quarterback to instead hit unrestricted free agency, Ian Rapoport of NFL Network reports. Keenum completed 28 of 48 pass attempts for 271 yards, one touchdown and two interceptions in Sunday's 38-7 loss to the Eagles. Keenum completed 25 of 40 passes for 318 yards, one touchdown and one interception during Sunday's 29-24 NFC divisional-round victory over the Saints. Keenum was 21-of-29 passing for 189 yards with a touchdown and no interceptions in Sunday's win over Chicago. Analysis: Keenum didn't need to do too much in the passing game after the Vikings got an early lead, but he was efficient as usual with a 101.1 passer rating. He'll try to keep his unexpected breakout season going at home in the playoffs after a bye. Keenum completed 14 of 25 passes for 139 yards and one touchdown during Saturday's 16-0 victory at Green Bay. Keenum completed 20 of 23 passes for 236 yards and two touchdowns while adding a 20-yard rush in Sunday's 34-7 victory over the Bengals. Analysis: Keenum was accurate and efficient, misfiring on just three passes while throwing touchdown passes from 20 yards and one yard out to Stefon Diggs and Kyle Rudolph, respectively. He was replaced by Teddy Bridgewater after the Rudolph score gave Minnesota a 34-0 lead, but there's no quarterback controversy here. Any inkling of such a narrative was put to rest when Bridgewater promptly threw an interception on his first passing attempt. Keenum will start Week 15 against the Bengals, Chris Tomasson of the St. Paul Pioneer Press reports. Keenum completed 27 of 44 passes for 280 yards, two touchdowns and two interceptions in Sunday's 31-24 loss to Carolina. He also scrambled five times for 40 yards and lost a fumble. Keenum completed 25 of 30 passes for 227 yards and two touchdowns during Sunday's 14-9 win over the Falcons. Keenum will start against the Falcons in Week 13, but Vikings coach Mike Zimmer said the team is still re-evaluating its quarterback situation on a weekly basis, Andrew Krammer of The Star Tribune reports. Keenum completed 21 of 30 passes for 282 yards and two touchdowns during Thursday's 30-23 win over the Lions. 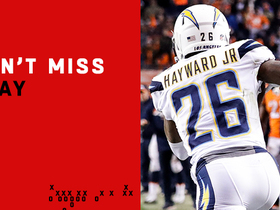 He also rushed seven times for 20 yards and a score. Vikings head coach Mike Zimmer confirmed that Keenum would start Thursday's game against the Lions, Chris Tomasson of the St. Paul Pioneer Press reports. Vikings coach Mike Zimmer admitted that it would be difficult to remove Keenum from the starting role, Chip Scoggins of The Minneapolis Star Tribune reports. "It's going to be hard to yank him out of there right now," Zimmer acknowledged after Sunday's 24-7 win over the Rams. Keenum completed 27 of 38 passes for 280 yards with one touchdown and no interceptions in Sunday's 24-7 win over the Rams. He also gained 20 yards on three rushes. Vikings head coach Mike Zimmer confirmed Wednesday that Keenum would remain the starting quarterback for the Week 11 home game against the Rams. The Vikings are expected to stick with Keenum as their starter for Week 11 against the Rams, Jason La Canfora of CBS Sports reports. Vikings coach Mike Zimmer said he has a plan for Week 11 against the Rams, but he declined to specify whether than plan features Keenum or Teddy Bridgewater as the starter, ESPN.com's Courtney Cronin reports. Keenum completed 21 of 29 passes for 304 yards, four touchdowns and two interceptions in Sunday's 38-30 win over Washington. Keenum will start at quarterback Sunday in the Vikings' game against the Redskins, Chris Mortensen of ESPN reports.